Most of us concentrate on that we can see, that which is there. Our eyes focus on the positive space first and foremost, rarely the negative. It seems the only time we consider absence solely is when one feels particularly existential, or perhaps because it is the lynchpin to a campy movie (air rights, Burlesque). Michelle Ray reckons with the void in The Cave Protection Act of 2013 and attends to the negative space. Inspired by the destruction of a mining town swallowed by sinkholes, she uses contradiction, sardonic humor, and repeated imagery to understand the seemingly irrational idea of guarding nothingness. 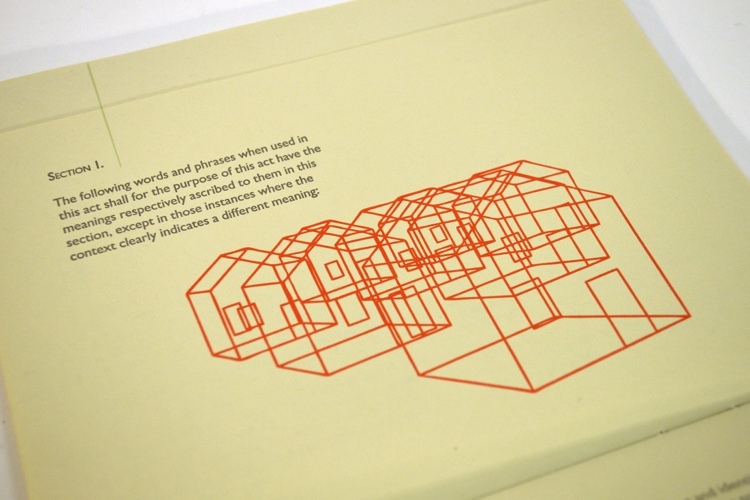 The outer case of the book introduces what will be a recurrent design motif: a basic contour drawing of a house of varying sizes, repeated and stacked. The way they are organized almost seems as if the largest house’s “head” is full of these mini versions of itself. 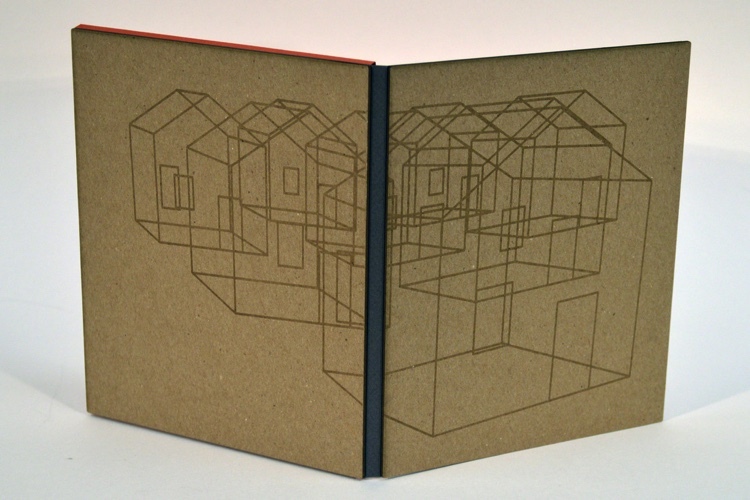 Another reappearing treatment presented here is how these houses are laser cut into the plain board; one has to tilt the case in order to see the subtle lines, which also occurs on some of the book’s pages as well. Upon opening, we find an orange case (another protective layer) with the title written on top. 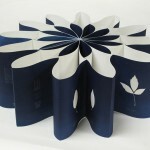 Inside this is our main booklet, which has tabs and can partially unfold accordion-style. 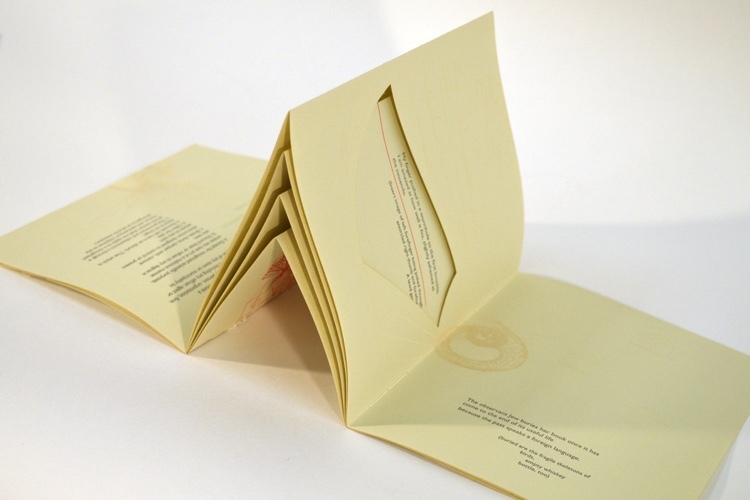 Side one is clearly shown because the words “Section 1” are visible, while the other side has “Section 4,” and the viewer must flip over to get to the second half of the booklet. 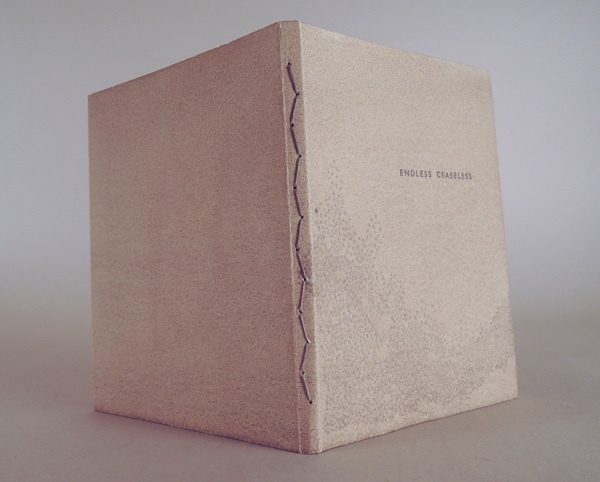 It is bound with thread, the pages an unbleached beige tone with light green margin line, a nod to notebooks or even old penmanship pages. Opening the first tab, we find the words “In order to dig for diamonds, you have to strip away the earth.” This prologue evocatively tells us we are dealing with the aftermath of mining, a violent scarring of nature. As the reader turns each tab, the text or designs switch from vertical to horizontal, a disorienting tactic that adds to the unsettling contents within. The second real tab is Section 1; it has purposefully obtuse, conflicting legal definitions of what a cave is, along with more informal language (“hiding space for weapons, unsent love letters; gloryhole”). 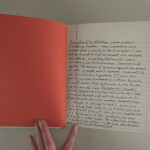 Additionally, there is text that discusses erasure in nature with the suggestive and conceptually dense line, “Forgetting is the same as having known but not knowing.” While this book is supposed to be about a cave protection act, these interspersed lines indicate what the subject really is: the seductive qualities of voids and emptiness. The stark houses pepper the pages again, this time outlined in orange; their hollowness emphasizes our immersion in absence. Flipping to the following tab, the reader knows what is next to read because the text’s orientation is similar to the preceding flap. 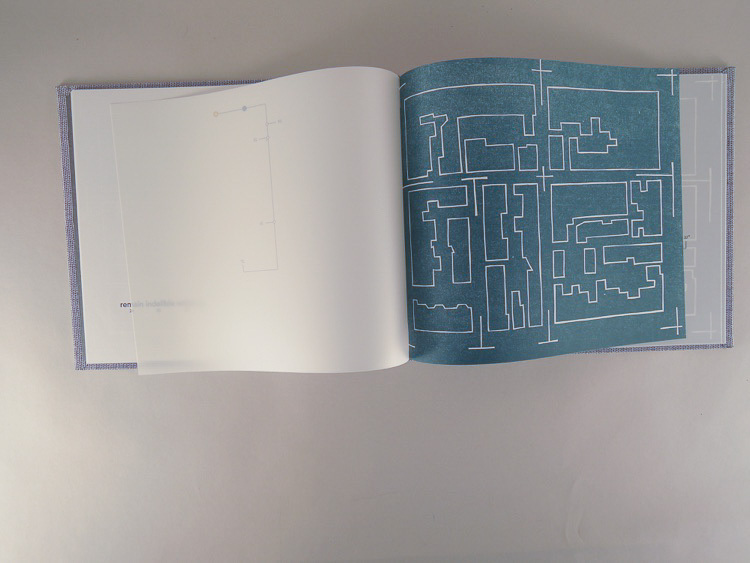 In contrast, the opposite page switches positioning, forcing the viewer to move the booklet to resume. In the first page, the definitions continue with “commercial caves” (inhabited by people and therefore unnatural) and “wild caves.” The audience is then given an analogy that is deliberately confusing and incongruous: “There: that:: not her home.” Who is she? Why is she gendered? This is not the last time a person mentioned is described as female; perhaps it is a reference to how spaces are gendered, like homes (domestic) and caves (nature). Now that the definitions have been dispatched with, one turns the booklet to arrive at what has merely been insinuated—how the caves came to be. Sinkholes materialized in Centralia, Pennsylvania, due to mine fires deep below. As if to stress this manmade disaster, there is a geometric line drawing of a sinkhole next to one of the houses. Each section contends with different aspects of these unnaturally created cavities. 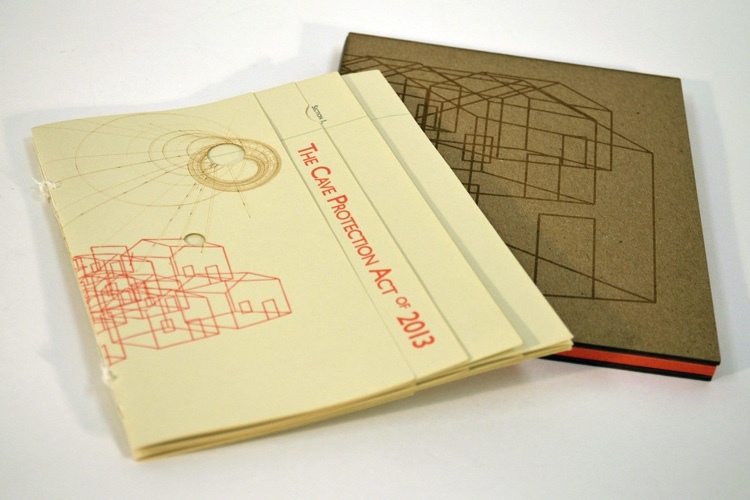 In Section 2, we get liability, along with faint green text that states, “The cave should pose a question rather than an answer.” Like many successful artworks, this book recognizes that art is a problem, not a solution, finding a like-minded subject in the inherent paradox of protecting absence. This text forces the reader to consider what sorts of issues arise from emptiness, such as how do we value something we cannot see? 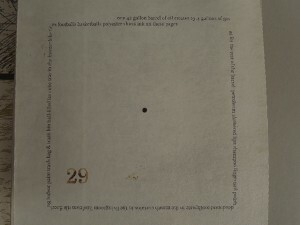 Moving forward, Section 3 deals with illegal acts in caves, along with a cut-out hole on the page; this is the midpoint in the book, indicating it must be turned over and begun from the other side. 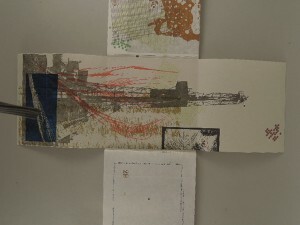 But first, the viewer reads words inside this paper pit; it is expressive and recounts slipping into the ground. 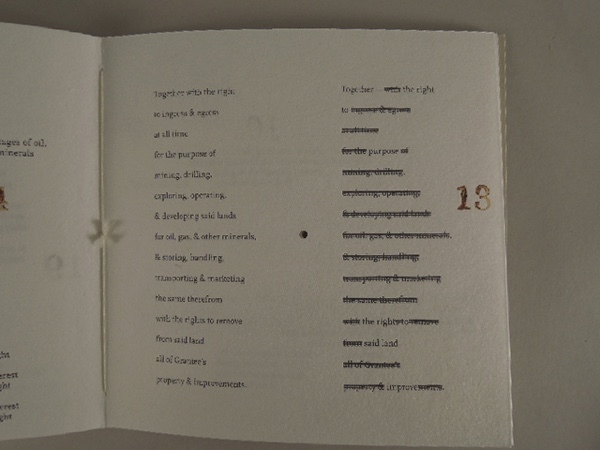 The open wound in the book is perfectly placed as if the text had fallen into a constructed hole. The opposite side of the fold brings the audience to the second half of the book, which unlike the first, goes from largest tab to smallest. The geometric spirals have returned, along with an elaboration of being trapped in the ground. 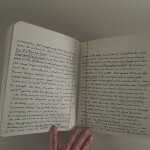 The reader also discovers this poignant sentence: “The observant Jew buries her book once it has come to the end of its useful life because the past speaks a foreign language.” Absences and memory are intertwined: in this instance, the memory of a town that disappeared with only voids lingering as evidence. This is a poetic way to consider how memory can be fragmented and lack whole sections, requiring attempts to piece together or fill in what happened. In further sections, Ray resumes mixing legalese with stream of consciousness (“No dumping of the dead.” with “Turn down your music. I’m trying to sleep.”), and this form of communication feels both psychological and dreamlike. The “sleep” mentioned here is another nod at memory, indicated with green writing underneath calling for “contemplation” in the cave. We must thoughtfully consider the past in the hopes of lessening the void, physically and philosophically. 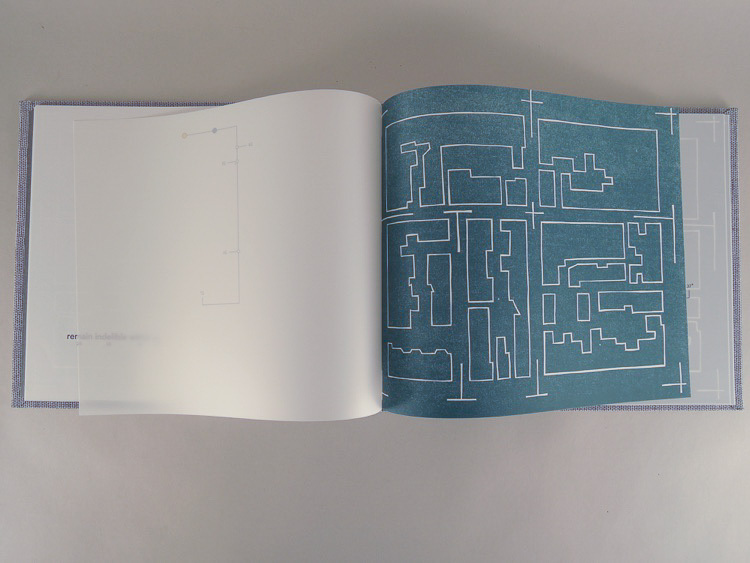 Overall, the back-and-forth of obfuscation and disagreement are as much of the design of the book as are the reiterated imagery of homes devoured and frantically repeated. 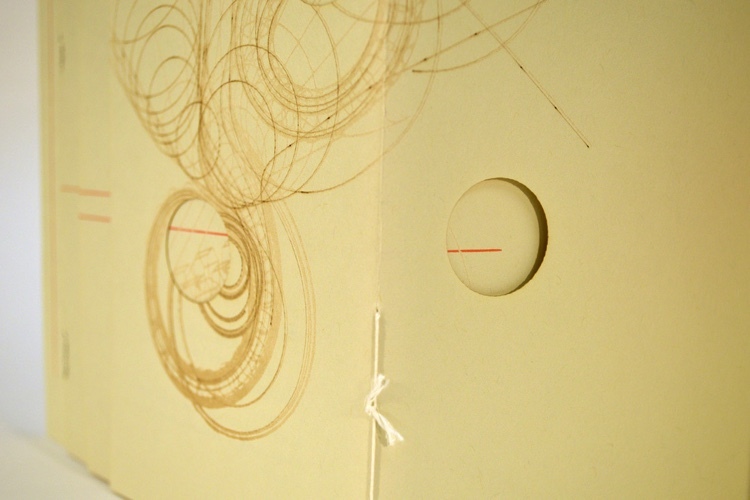 These inconsistent ideas speak to the absurd subject of the book, and Ray ends her piece with burned spirals and lines, shooting out from the holes in the paper. With this, we see something comes from nothing, a final, fitting contradiction. Americans have been parasitically entwined with the Western landscape through oil for over a century, developing in time to its own mythology. 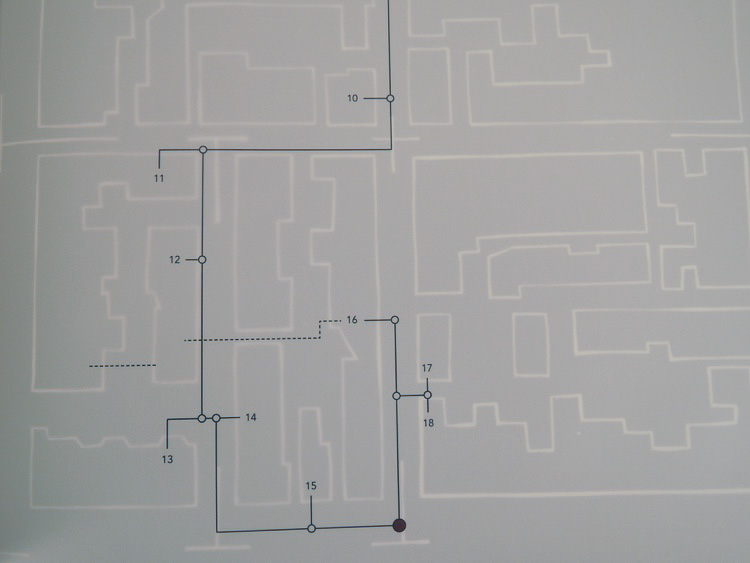 Whipstock by AB Gorham is a curious puzzle devoted to this lore. A considered experimental piece, it lyrically examines the way oil has seeped into our land, our economy, our history, and our lives. 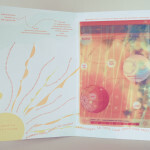 Roughly the size of a CD outside its outer casing, Whipstock unfolds with booklet flaps left and right; each booklet is connected at the middle and unfolds both horizontally and vertically. Within the handsome outer case, there is a series of numbers 1-36 that snake through in rows (reading let to right, right to left), punctuated with small holes. 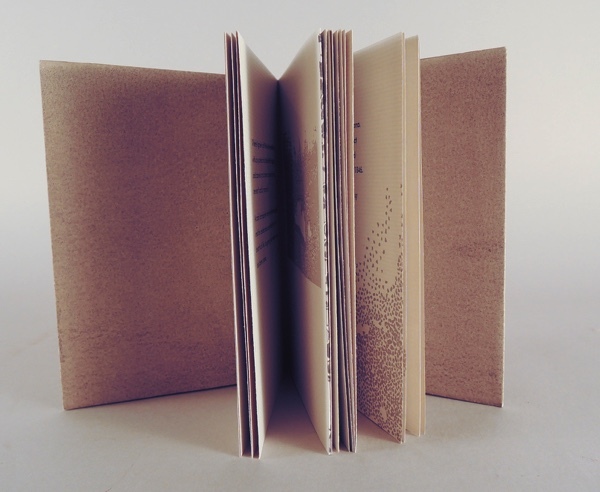 These holes pepper the booklets at various points, almost mimicking a drill piercing through the dirt. 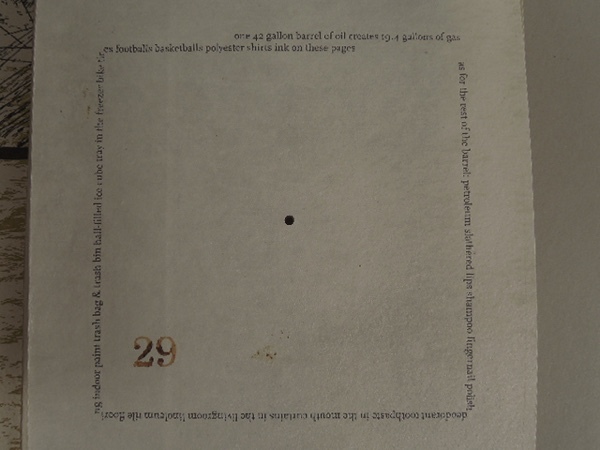 “Oil,” or rather small blobs of brown ink, are interspersed throughout, much like a miniature spill soaking into various pages. 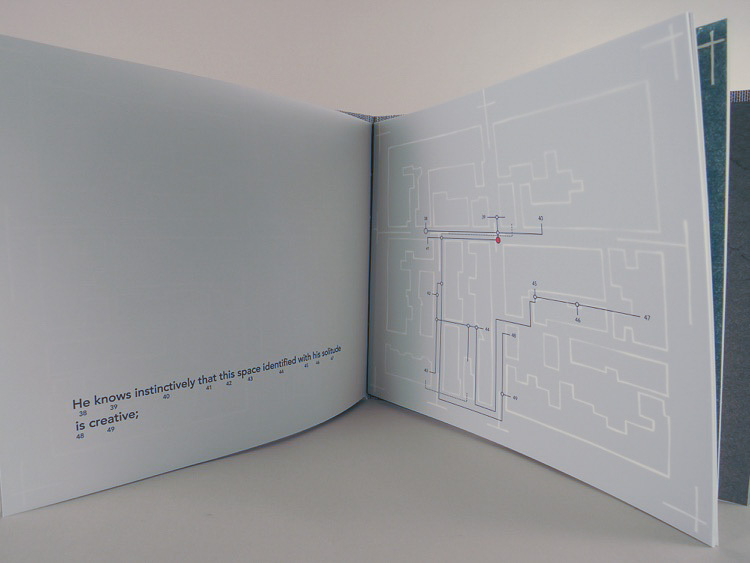 The numbers appear again within the booklets, and they are a guide for reading Whipstock in an order, although one could easily read without that direction. Finally, the case cover contains imprints of imagery that repeats later in the book without color, appearing to be linked to drilling. These numbers force the reader to “dig” through the work; one might start right and discover the next number is on the opposing booklet. 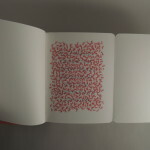 One could also flip the pages like a traditional book, but then be flummoxed by the next number disappearing—or rather, this trail pushes the reader to alter how they have read thus far by unfolding vertically. 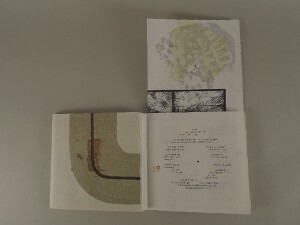 Gorham is quite strategic in this layout, deploying a metaphor of burrowing and uncovering while engaging with the work. And now, the content of the pages: Whipstock is a mostly linear yet stream of consciousness/poetic rendering of the history of oil production, from the geologic to more intimate human-scale concerns. Even within pages, it can be challenging to know what to read first, and each reading can be unique. Words are placed in a circular fashion, as lists, diagonal, upside down, and sometimes as shapes. They are as much words as pattern, and the reader needs to turn and move the book to really be able to read in full. Whipstock is not a passive engagement to say the least! This language encompasses all aspects of oil, such as legalese on the vagaries of oil production detailed in #13. There are two columns side by side with the right repeating the left column’s words but crossing out sections, leaving the reader to ponder the significance of this directed act of partial removal. In #29, we get a brief but incisive list of uses for oil besides heating and transportation; mundane items like nail polish, footballs, and the “ink on these pages” occur. This crucial inventory shows how interconnected we are to oil in every facet of modern life, whether we are aware or not. Prior to this is entry #28, which details a pipe bursting and leaking into farmland soil; Gorham seems to be demonstrating the dependence of oil in this country is not without ecological consequences. Oil is everywhere, and despite its origination in the deep earth from dinosaur bodies and ancient flora, the toxic outcomes are far from natural. We see this accentuated in oil daubs such as #33, which also spreads over small grids. Are these fences? Or perhaps farms? A muted, earthy color palette of dulled greens and browns compliment the focus of land, and the shapes within these printed imagery shift between abstract and exact, much in the same way language is used throughout Whipstock. As a climax of all this flowing rumination on oil in the West, the very instrument of removing oil from the earth is at last displayed: a brightly colored oil derrick, prominent and direct in pages #34 and #36. 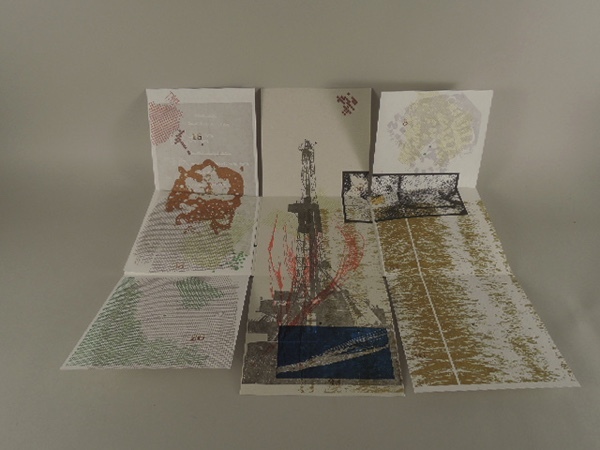 There are wheat plants printed over sections, suggesting a relationship: rising wheat, rising derrick, with wheat superseding and overlaying the derrick, signifying its dominant importance. The interplay underlines our manipulation of the earth towards our own ends, regardless of cost. AB Gorham has created an interrogative work on the depth of human intervention in the land, leaving the readers questioning their complicity in this and just how much the oil industry’s positives outweigh some disastrous negatives. 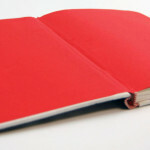 Perhaps the most recognizable and definitive of school supplies is the composition book. This ubiquitous, bound notebook with typically wide ruled pages was an easy way to take notes or jot down information in classes—at least, for those of us used to pen and paper more than computers and typing. 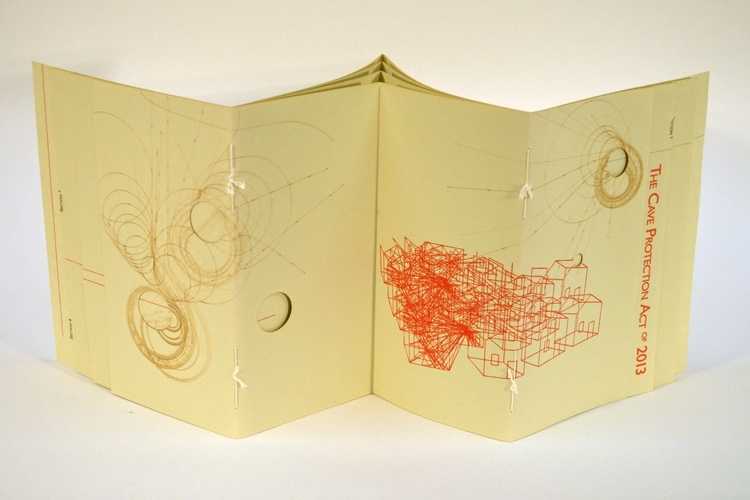 Candace Hicks deploys this schoolbook as a visual language in Coincidence. 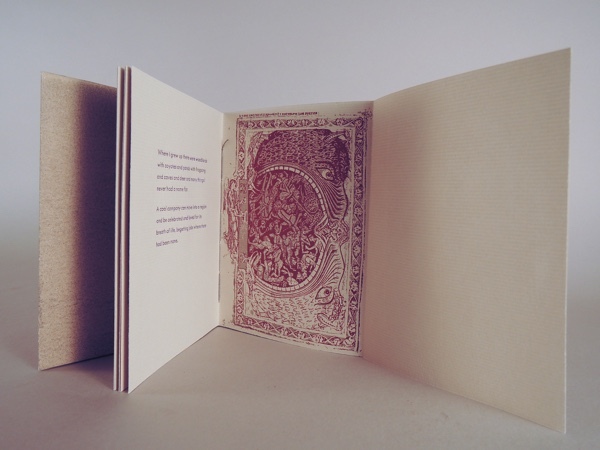 Just a bit thicker, perhaps a bit larger than the one we are used to, this composition-style work instantly assures the viewer that what they are about to encounter is going to be a handwritten, unique experience. 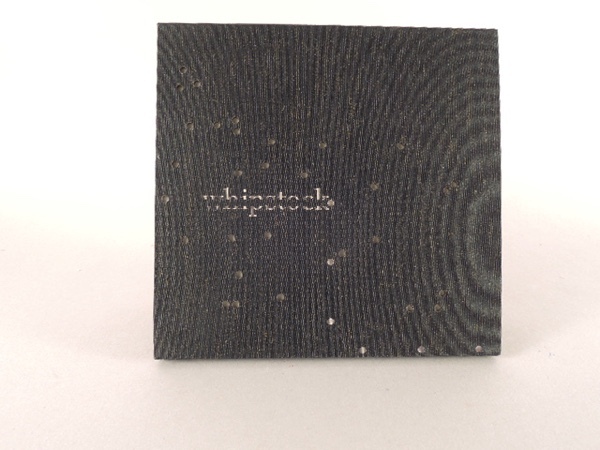 Upon initial examination, the outer cover of the book is similar to the most traditional of composition books, black with white cracks. These bits of white mimic the tunnels of ant farms (another school staple). Small ants crawl around, curiously searching for something; these creatures march onwards inside, as the audience soon sees. 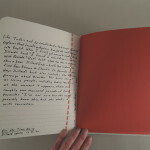 Once opened, the inner pages of Coincidence are a simple but bold red. 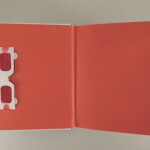 Nestled on the left cover are red tinted glasses, like the disposable 3D kind, though they do not recreate that three-dimensional effect per se. The lenses are solely, emphatically red; once put on, everything is strongly colored to that shade. 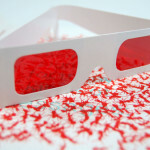 These glasses are a portal to a secret message, which we’ll get to shortly. 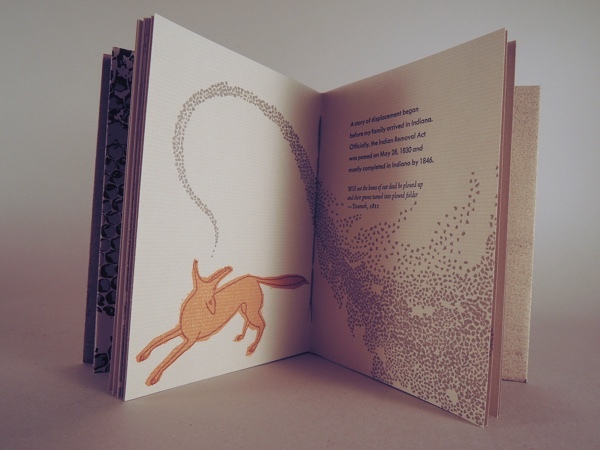 Taking the glasses off again, the viewer turns the page to the beginning of the book. Here, Hicks has used what looks to be her own handwriting in black ink (replicated in printing) to discuss coincidences. 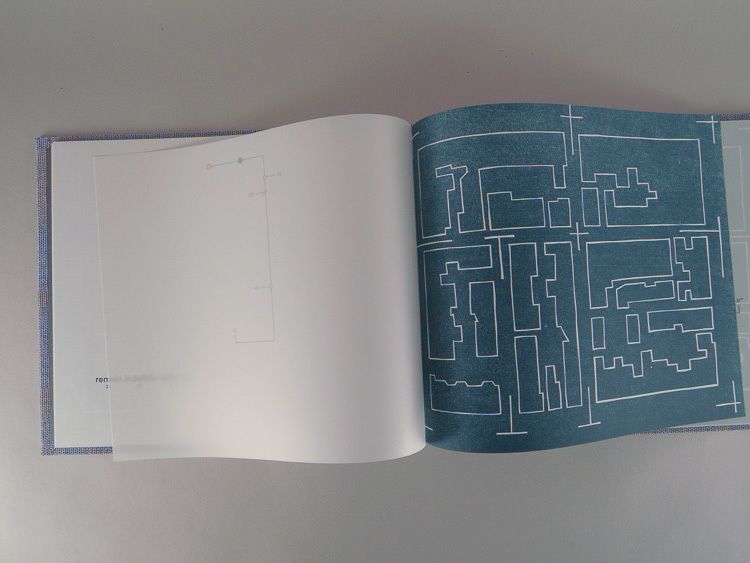 Looking closely, the blue lines of the pages, are actually made of small ants moving in formation. So is the red margin line, both easy to miss without alert attentiveness. Continuing this scholastic theme, “corrections” are made to the text via red ink, the go-to correction pen, pluralizing some words and making other minor adjustments. This simple color scheme of black, red, and the faded blue emphasize and focus the audience’s attention on the text, or story, within the pages. 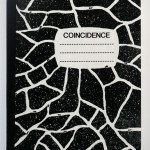 Hicks reviews coincidences, or rather, a series of flukes that have clearly affected her in some way. Written almost in a stream of consciousness listing style, she starts by mentioning that these chance accidents tend to come in pairs—and then she’s off. We read about the anatomist murders in 1828 Edinburgh and how the two books she read depict the murderers in varying ways (one sympathetic, the other cruel), then to Napoleon’s wallpaper, its arsenic content, and the incorrect link to his demise. This portion of the book flows in this manner, a series of events that link together, hopping around history, literature, mythology, the everyday mundane, movies, and much more. In some way, it feels as though Hicks, by describing this familiar yet intangible phenomenon, is trying to be open or welcoming to the universe in order to experience these accidents. These incessant links are listed breathlessly but matter-of-factly as she recounts each paired set. At one point, she mentions apophenia, which is “the experience of seeing patterns or connections in random or meaningless data.” She reads about this in a book and then immediately hears about it on Radiolab, a radio broadcast on science in everyday life. This cheeky association shows Hicks’ humor and self-awareness as she carries on with her task, relentlessly enumerating. As if to bolster her examination of coincidences, she adds footnotes to some pages, another academic reference. Finally, as if spent, the book ends with a last correlation and no explanation or summation of what has come before. But what about the red glasses? 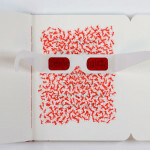 This is where the viewer can giddily feel as if they are reading hidden code in invisible ink—because in a way, they are. 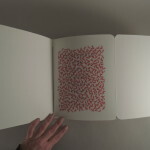 In between the pages on coincidences are foldout pages; when the viewer pulls out the page, they see a series of ants creeping in haphazard formation. With the glasses on however, the true purpose is revealed. Each foldout tells part of a story, which goes thusly: famed etymologist E. O. Wilson discovers that ants use chemicals to communicate. He figures out how to chemically respond, directing them to “follow me,” then painstakingly collected these chemicals from the ants. 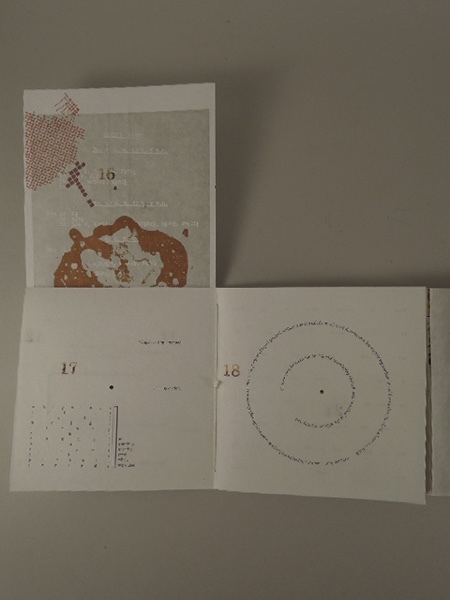 Using these pheromones, Wilson writes his name, and the ants line up to create the font, which the final foldout presents. This linkage between hidden messages, ants, connection, and more all underline the purpose of Hicks’ work: coincidences and making sense of fragmentation. 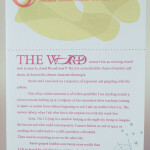 Swirling, eager, and somewhat surreal, Coincidence is a rousing exploration of a variety of media and life in general. 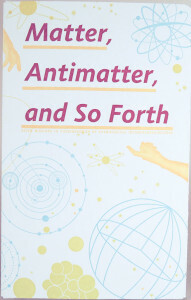 Simply put, Casey Gardner’s Matter, Anti-Matter and So Forth is a marvelous journey through space, time, and philosophy. 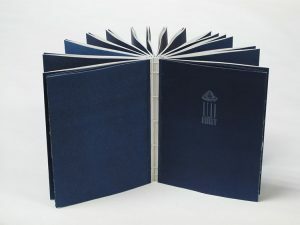 Seven folios of letterpress with transparent pages are nestled inside a case with illustrations of constellations; they are not the familiar ones we see in the sky, but rather based on the seven components seductively investigated in the folios: light, gravity, time, matter, infinity, constellations, and science. 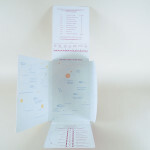 These heady topics are examined within each corresponding booklet; moreover, they can be stood upright and opened to mimic stars, underlining the astronomic expedition viewers within these folios. 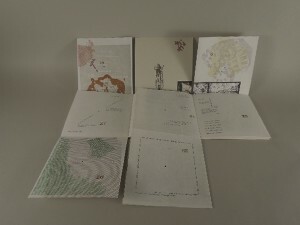 While the viewer can select any reading order almost like a version of Choose Your Own Adventure, the booklets are best in sequence. In fact, they are helpfully numbered to guide the way. 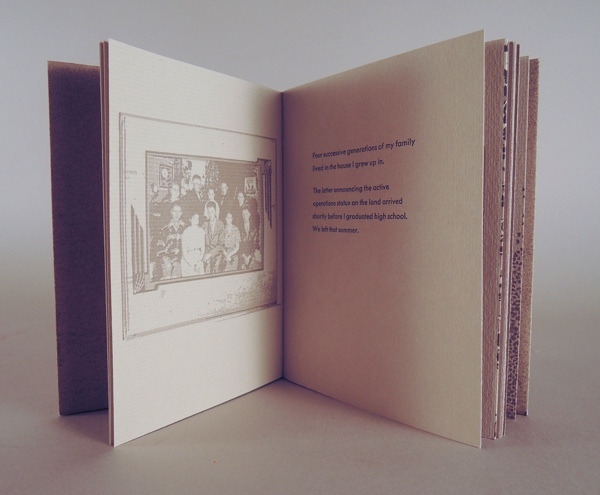 Each of the folios shares the same layout: the cover/first page is devoted to a first person story (more on that later), then within is a discursive examination of the subject. 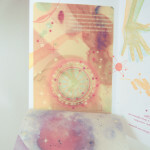 On the right interior are two transparent pages that layer gorgeously onto each other, titled “Intergalactic artifacts from the transparent universe.” If the rest of the booklets are a tasteful yet somewhat restrained use of color, these transparent pages enthrallingly explode with inky or watercolor techniques, graphic elements, and so on. 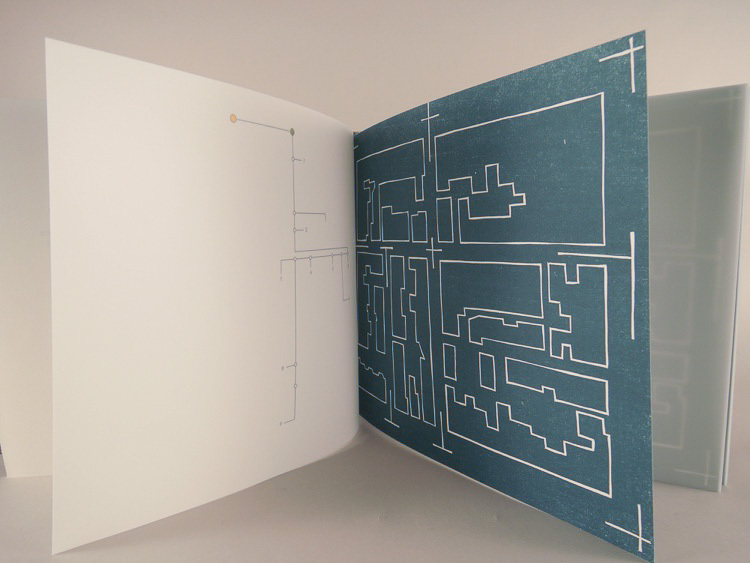 Underneath these pages reveals the letterpress booklet; meanwhile, the back page/cover is dedicated to methodically “collecting data” from the previous pages and analyzing and organizing this information. Now, the story: the audience reads of an explorer named Phoebe (the name slyly references a moon around Saturn), detailing her trip through the cosmos, exploring each of these seven subjects as she searches for knowledge and perhaps a purpose. 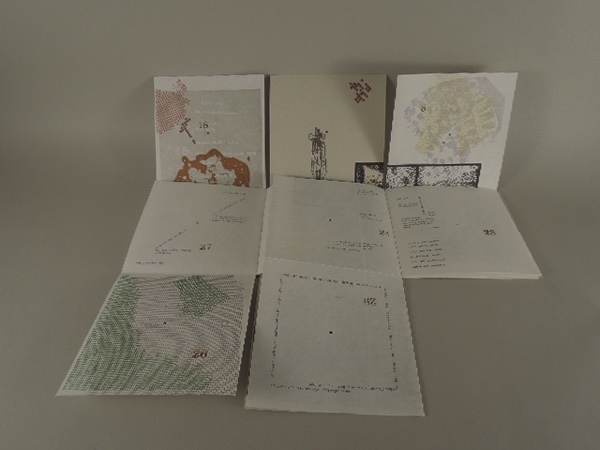 Based on the writings within each folio, she finds more questions than answers as she progresses through her travels. As this voyage continues, she meets a fellow wanderer named Amos9 who joins her for part of this cosmic trip, seeking his own quest for the 10th dimension. 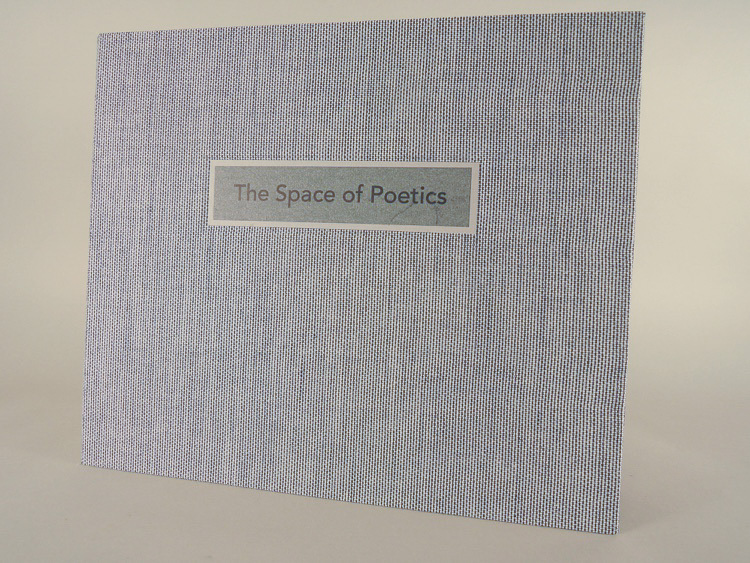 It is impossible, as you read through each booklet, not to feel as if you are with Phoebe as she discovers and journeys through space; much of this is due to Gardner’s effectively succinct and intriguing method of writing this bit of fiction. Phoebe and Amos9’s trip includes a stop during The Big Bang, other time traveling, and being physically affected by the effects of several natural phenomena. 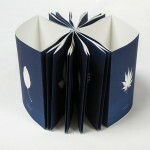 Wonderment and curiosity delightfully mesmerizes the viewer as they read through these philosophically dense folios. For instance, the first folio Light opens Phoebe’s expedition with “I always travel light” (this statement ends the final folio, Science) and describes a gifted telescope from her aunt. 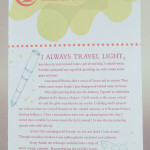 Inside, the book is a free-form, rambling evaluation of the concept of light. A sun is in the lower left corner, and instead of rays, words radiate outward, such as “Stars (repeated 13 times) compose us.” As the audience contemplates these various statements, the transparent pages add to the theoretical discussion with “fusing and radiating the visible and invisible.” The layers build, visually reviewing redshift, which refers to how we measure the distance and movement of remote celestial bodies. As they drift away, the light emitted from them is like a coiled spring being stretched out. Thus, as the galaxy or star proceeds, the light sent out shifts towards the red end of the electromagnetic spectrum. Gardner has clearly been careful in her research for these sections; anyone either unfamiliar with these concepts or a person knowledgeable about the subject could glean different but thoughtful information. 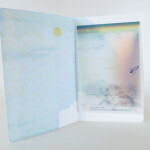 The back of Light (and the other folios too) breaks this material into three specific categories: the “mission” (i.e. Light), data, and impressions. Under this last section, frequently the item “Further inquiries” appears—in Light, she writes “I hope to understand why I came this way.” These invigorating thoughts are a way of digesting what came before, both for Phoebe and the audience. 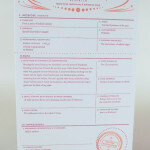 A seal depicting a mission benediction, as if formalizing this space traveler’s report, appears stamped at the end of this back cover. 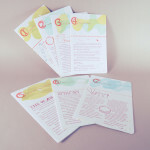 One cannot help but be absorbed in pondering the stimulating questions posed within the booklets. 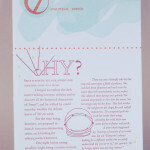 In Gravity, the interior page has “Do we make the weight or does the weight make us?” This question is perhaps half answered under the folio’s transparent pages with “Weight is made by resisting an opposing force,” leading the viewer to consider their place in the universe, society, and their own effects as thinking human beings. The philosophical conundrum of “why is there something rather than nothing?” is mentioned as well; this question has had recent surge in popularity in works like Jim Holt’s Why Does the World Exist? : An Existential Detective Story. There, Holt tracks down scientists, philosophers, and religious persons to try and answer this fundamental question of our universe; meanwhile, Gardner gets at a similar examination but in a more lyrical, visual manner. There are so many of these queries and reflections in each booklet that the audience is cheerfully captivated into spending a great deal of time mulling over each section, something Gardner has certainly intended with precise care, encouraging viewers to deeply examine each statement, illustration, and more. 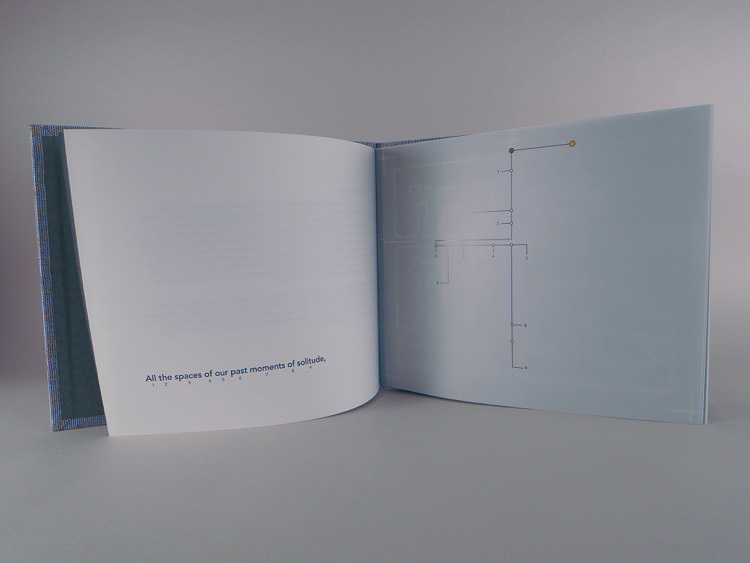 Perhaps one of the most stunning segments in all the folios is the transparent pages in the final booklet, Science. A richly colorful depiction of the universe, with several galaxies illustrated in an expressive, painterly fashion is shown. There is also an arm outstretched; here, Gardner references art history with Michelangelo’s The Creation of Adam, though some key differences emerge. 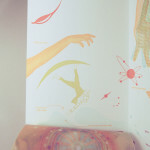 The arm has the same iconic gesture as Adam, but upside down and female, and the fingers point deliberately upwards to the stars. 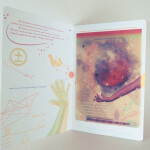 This booklet’s back cover concludes with “We are all space travelers” and “This is all an experiment.” This reminds the audience of the enchanting journey they have embarked on vicariously and actively, through exploring each page and making associations and conjectures from the questions raised. Matter, Anti-Matter and So Forth is a fantastic mishmash of art, science, and hints of popular culture, and its unique consideration of these themes is an absolutely welcome delight. The experience is akin to the astronaut’s at the end of 2001: A Space Odyssey, feeling blissfully overwhelmed by the phenomena of the universe. Because there is so much packed into this piece, it is happily possible to rediscover new elements each time one revisits the work—a rewarding mission indeed. 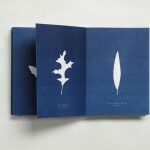 Michael Sharp’s Book of Leaves is a work firmly steeped in the past, exploring scientific, photographic, and ecological histories within its pages. 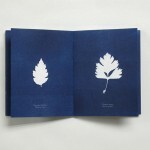 Using cyanotype, an old photographic process that results in a rich dark blue, Sharp placed dried leaves collected around the Utah State Arboretum at the Red Butte Gardens and created photograms once the paper was exposed. Leaving behind a ghostly outline, each leaf from specific trees tells a different story and hints at a distinctive personality. 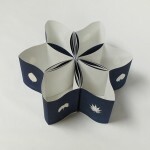 Upon opening the small, compact box, the viewer finds what initially appears to be a modest book entitled Utah Diversity, and above this is a symbol that appears to be a beehive or perhaps a pinecone. 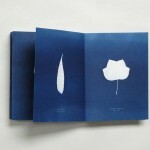 On the box itself in diminutive type, we learn about the history of cyanotype and its use in scientific documentation of natural objects and also in blueprints. 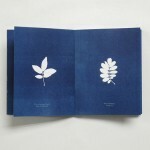 The artist also mentions a critical feature the viewer encounters when unfolding the book: bits of the cyanotype peel or flake off. 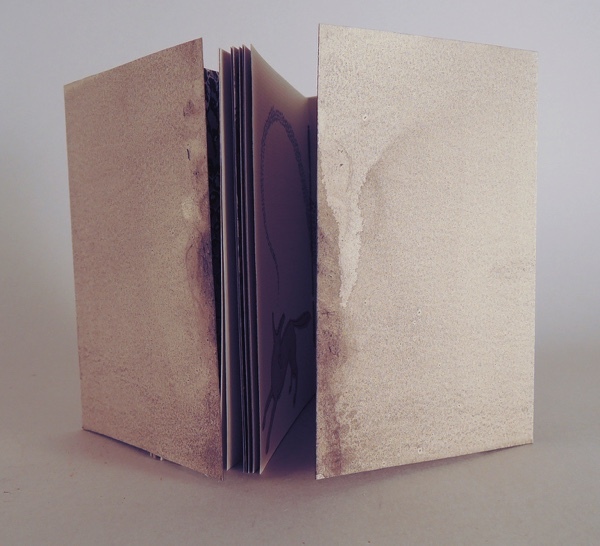 This crumbling deterioration is analogous to the subjects within the pages, the fragile dried leaves, reinforcing the relationship between the subject and the book itself. Once opened, the viewer is informed that the images following are a “representation of the (tree) populations.” It is here that the charming piece shows its true intentions. Each leaf, as if it were a separate person, appears with its Latin name and common name. No two leave are alike, and they are paired together at times because of shared or discordant characteristics. For instance, the Cully Black Birch and the European White Birch look like siblings, with a similar shape and outline. In other cases, like the Yoshino Cherry and Blacklace Elderberry, we have a very oval leaf with tiny jagged edges (Cherry) opposite a thin-leafed, smooth-textured Elderberry, which is reminiscent of a small flower plant in shape. Some leaves, like the Fairmont Ginkgo, have an almost human-like quality. One can almost see a face in profile on either side of the leaf, or perhaps even a pair of lungs, coming from this particular outline. Much like Rorschach tests, it is hard not to try and see shapes, people, or other fanciful interpretations. The more the viewer pages through the book, the more the march of quirky personalities and mysterious histories play out before them. 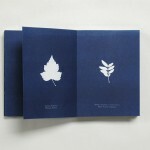 Book of Leaves is foremost a book of memories. From the precise curation of the trees that Sharp selected to the drying and exposure of each brittle leaf, this documentation reminds the viewer of each step in the process before them. Remembering that even the paper is an artifact of a tree turned into pulp, this piece is haunted by all aspects of ghosts concerning the humble tree. But perhaps the most delightful feature of this work is what it transforms into. 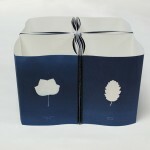 Book of Leaves can be stood upright and unfolded like a star-shaped accordion. 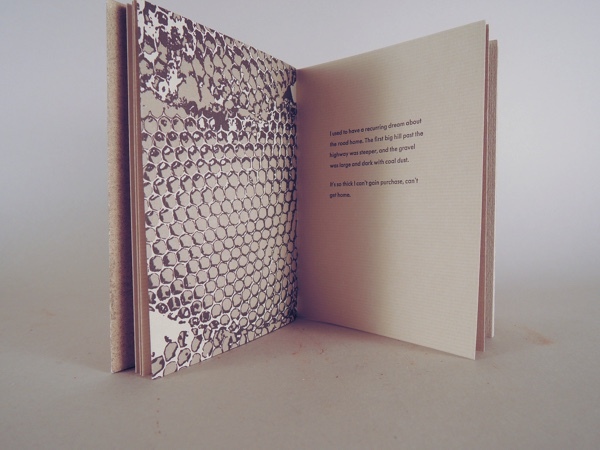 Suddenly, it has transformed and mimics one of the many leaves found within, creating an organic pattern based on how the audience choose to unfold the pages. 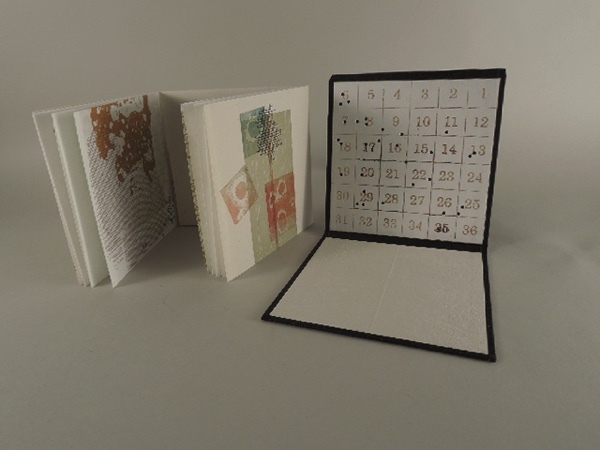 Each iteration and choice creates a new work in a way, reinforcing the concept of this book being about memory and adding a unique performative element. As mentioned previously, some of the cyanotype falls away as well, slowly eroding the book as much as the process of decay in nature. Sharp’s work is meant to be gently playful yet a bit fragile, referencing the subjects and the fleeting history that lies within.